As a self-professed foodie, especially when it comes to San Francisco Bay Area restaurants, the Michelin Guide is a handy way to navigate the finest local eating establishments. Consider this post as your road-map to culinary excellence and I hope you enjoy the variety, freshness and innovation I have come to love so much about restaurants throughout the San Francisco, the Peninsula and extended Bay Area. When is the Michelin Guide Released? 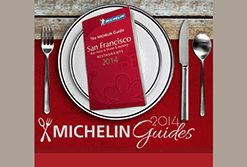 The 2014 Michelin Guide to San Francisco Bay Area dining establishments was officially released on October 23, 2013. (Look for the 2015 Michelin Guide in October 2014.) The most noteworthy upgrade on the list is Quince, which succeeded in earning a coveted Two Stars. The French Laundry and The restaurant Meadowood remained on top with their Three Star ratings, while State Bird Provisions, on Fillmore in San Francisco, saw its first star as a newcomer to the guide. 2014 Three Michelin Stars – Exceptional Cuisine. Three stars, the highest rating, is given in recognition of exceptional cuisine. It identifies restaurants where diners are met with distinctive dishes, precisely executed with the utmost in fresh, distinguishing ingredients. Michelin Three Star establishments aredestinations in and of themselves. 2014 Two Michelin Stars – Excellent Cuisine. Two stars are given in recognition of excellent cuisine of outstanding quality. Dishes are crafted with obvious skill and care. Michelin Two Star restaurants are worth a trip off the beaten path. 2014 One Michelin Star – Very Good Cuisine. One star is given in recognition a very good restaurant in its particular category. It acknowledges cuisine prepared to a consistently high standard. Michelin One Star establishments are certainly restaurants worth a stop.